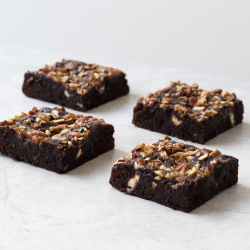 We've been refining and honing our brownie recipe for the past 15 years and think we've landed on the perfect combination - fudgy, soft and slightly chewy with a big chocolate hit. 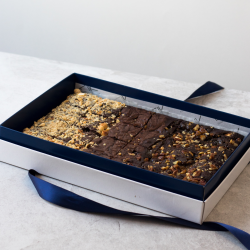 Every single brownie is baked fresh to order and sent within 1 day of baking for maximum freshness. We don't freeze our brownies or add anything to prolong shelf life. EK bakery supports local and British producers - we buy our butter, eggs and flour from British farms. Chocolate and sugar comes from further afield but we ensure that they're fairly traded and great quality. EK is the home of bespoke brownies - we are making your brownie dreams come true. You choose the flavour, we'll bake it fresh to order. Popular choices include salted caramel, peanut butter or fresh raspberry but you can go as daring as you like. We've had requests for salted pecan & rosemary, coconut & lime and even, marmite.